Text & photographs copyright © by Paul M. Remfry. he two castles at Aston stand roughly half way between the centres of two baronies, Wigmore 4 miles to the west and Ludlow 3 miles to the east. At Domesday (1086) Aston (Hesintune) was held in demesne by Ralph Mortimer of Wigmore. Previously the vill had been held by 5 men as 3 separate manors. In 1086 it consisted of 3 hides which paid tax. In these lands were 2 ploughs, 5 villagers and 2 smallholders with 3 additional ploughs between them. Domesday records that before the coming of William the Conqueror in 1066 the land was waste, but it had now recovered to the value of 30 shillings by 1086*. From this date on until 1305 there appears to be no further mention of Aston, so presumably the land remained in the demesne of the Mortimers of Wigmore. Unfortunately the Mortimer lands were never subject to royal inquisition during the early Middle Ages. Consequently all that can be said about Aston is that it most likely remained in the hands of the lords of the barony. Aston is next mentioned in 1305 when it was found by inquisition that John Birley held 1 knight's fee in Aston, Ashford Jones and Kinton and a further fee in Birley, all of which were held from the lord of Wigmore*. However in 1243 and 1256 his ancestor Simon Birley was only recorded as lord of Birley and Ashford Jones*. By 1361 John Birley seems to have further extended his estates by adding the Mortimer land of Kinton. At the time of his inquisition he was recorded as holding 1 1/3 fees in Aston, Ashford and Kinton and a further fee at Birley*. This would indicate that the three independent vills were acquired from the Mortimers in the late thirteenth/early fourteenth century. Beyond this nothing can be sensibly hazarded. If the tenurial history outlined above is correct it is likely that any castle at Aston was the work of the Mortimer lords themselves*. During the Anarchy of King Stephen's reign Hugh Mortimer of Wigmore was recorded as being at war with Joce Dinan of Ludlow some time between 1139 and 1148*. Joce Dinan had become an enemy of the royalists who included Hugh Mortimer, William Braose of Radnor and Osbern fitz Hugh of Richard's Castle by the end of 1140*. After 1144 Gilbert Lacy and his allies who included Hugh Mortimer, attacked Joce in Ludlow castle after Dynan gate towards the river had been opened. During the attack a tower over the gate was burnt and the keep (high tower) largely overthrown*. On reaching this low point Joce began to fight his way back. After 1148 Sir Hugh Lacy (d.1186), a great friend of Hugh Mortimer, advised him that the new abbey he was building for the Shobdon monks at Lye near Aymestrey could be made use of by an enemy if captured. Mortimer at this time was surrounded by enemies and there was a great hostility towards him. Consequently he accepted his friend's advice and demolished the unfinished church, moving the monks to Wigmore. Hugh then so pertinaciously pursued his war against the Angevins that Joce Dinan was not able to move about his lands freely. At this point Joce contrived to capture Hugh when he was virtually unattended and the lord of Wigmore was later ransomed for 3,000 marks of silver, all his silver plate, horses and hunting birds. It was probably during this unsettled period that Aston No.1 castle was built and that any siege of it would have occurred. The Mortimers with their main castles at Wigmore, Dinieithon and Cleobury would seem unlikely to have built another in Aston manor, unless it was under threat. Such a threat would only have occurred with the rebellion of Miles Gloucester in 1139. It seems unlikely that Aston No.1 was built in Mortimer demesne lands before 1139. It would also seem unlikely that the siege castle, Aston No.2, dates to after October 1154 when Henry II came to the throne. In the spring of 1155 Hugh Mortimer and Earl Roger of Hereford rebelled and the new king was forced to march against them with the feudal host of England. Earl Roger quickly capitulated, but Hugh was made of sterner stuff and three of his castles were besieged, Wigmore, Cleobury Mortimer and Bridgnorth. After a three month siege during which Cleobury castle was destroyed and siege castles, probably built at all three sites (one north and one south of Wigmore castle, Castle Toot above Cleobury and Panpudding Hill (originally founded by Henry I in 1102) at Bridgnorth), Hugh Mortimer made his peace with King Henry towards the end of July 1155. The forces brought to bear by Henry against Hugh Mortimer show several things. The strength of Wigmore and Bridgnorth, which the king failed to take after 3 months of arduous siege, and the strength of Mortimer, whom Henry II held in a lifetime's distaste, but of whom he could not rid himself. An attack in such force against Aston No.1 would probably have been using a sledgehammer to crack a little nut and it is doubtful if this castle was victualled against the Crown. Aston No.1 is not a castle 'to laugh a siege to scorn'. The siege castle at Aston No.2 does not seem to be on the same scale as those at Wigmore, Cleobury and Bridgnorth, though possibly this is because Aston castle was not seen as such a threat. Consequently it would seem best to interpret Aston No.2 as a baronial siege castle of the mid 1140's to early 1150's, probably built by Joce Dinan. Aston No.1 motte (A) consists of a typical castle mound some 30 feet high still surrounded by a mostly damp and periodically flooded moat (C). 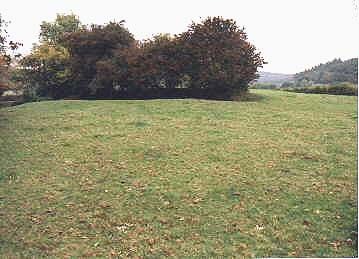 The octagonal motte (A) top is about 50 feet across and to the south are the foundations of what would appear to have been one side of an octagonal tower keep, probably similar to the one found at nearby Richard's Castle. The motte slopes have much loose stone tumbled down the sides and into the moat. The implication from the above is that Aston No.1 consisted of a stone tower on a motte, which probably dates to the Anarchy or slightly earlier. 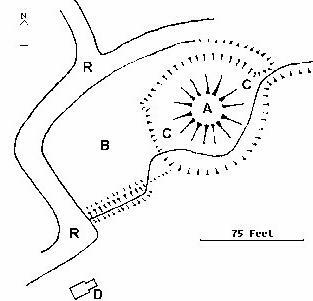 To the west of the motte (A) and its encircling moat (C) is a roughly rectangular field bounded by a short, but steep drop to the road (R) to east and north and by a stream which feeds off the motte moat (C) to the south. This was undoubtedly the castle bailey (B), though it is now much denuded. 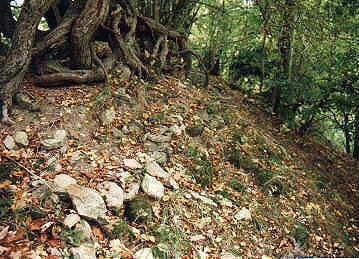 The stream to the south of the bailey (B) has been diverted in recent times and this has cut into the old bailey rampart showing that it is made up primarily of a stream washed gravel. The farm track also bisects the bailey (B) north to south close by the motte (A). This has resulted in the lowering of the bailey bank to the north and its and the bailey ditch's complete destruction to the north. Entrance to the bailey (B) was probably to the north as the suggested siege castle covers this side of the fortress. An entrance on this front is suggested as impeding soldiers entering or leaving Aston No.1 would surely have been a primary responsibility of the besiegers in Aston No.2. Some 700 feet to the north of Aston No.1 is a much denuded 'ringwork' (R) and bailey (W), Aston No.2 (shown at right). Mr Peacey, a local landowner, reported that immediately west of the castle, 12 shards had been found in a spoil site. They dated from the period between the eleventh and sixteenth century. This may only mark occupation debris from the village and may not be concerned at all with the castle, but the find is useful in indicating activity in the district from an early date. 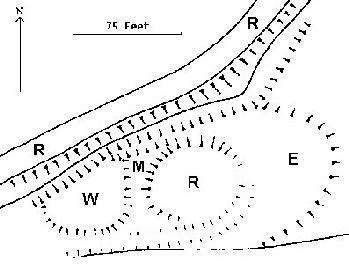 Aston No.2 consists of a low, ditched 'ringwork' (R) about 75 feet across, much destroyed to the south and east. The ditch (M) which is best preserved to the north is only a few feet deep and the scarp of the mound behind it is only about 5 feet above the ditch bottom. To the south the mound has been mostly ploughed out, but a good green crop mark of the ditch's original position is often apparent. A stream running between the mound and the metalled road (R) to the north provides a steep sided gully which protected this front from attack. The weak and irregular bailey (W) seems to have lain towards Aston motte (A) some 700 feet to the south-east. This too has been heavily denuded to the south. There is also a possible bailey (E) to the east. The flimsiness and lack of masonry at Aston No.2 would seem to leave little room for doubt that this was the siege castle*. Aston No.2 is therefore quite likely to be one of the 1,115 castles destroyed by Henry II in the aftermath of the Anarchy of 1139 to 1154. Aston motte may also date to this period and may also have suffered the same fate, after all a castle here would have been of little strategic interest to the Mortimers when their friends and allies were once again installed in Richard's Castle and Ludlow castles. 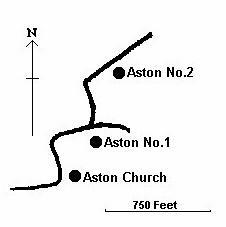 A final point about the provenance of Aston castles might be deduced from the church. Aston church (D) is rightly known for its fine Tympanum and decorated chevron arch. However it should also be noted that the top of the door is chamfered. A similar, but more complex arrangement can be seen at nearby Yatton chapel. This similarity of design might suggest a common patron. Initially such a patron might be sought from the ranks of the Mortimer family. However between 1119/27 and 1137 Wigmore barony and its appurtenant lands were apparently in the hands of Payn fitz John, Henry I's able lieutenant*. Rowlestone church in Ewias also has a fine tympanum set in a decorated archway. Payn fitz John also held this barony* and as an appurtenance of Wigmore probably Shobdon, where again there are fine tympana. Therefore the possibility that Payn was influential in the Shobdon school of architecture, and may also have been responsible for Aston No.1, should not be ignored.